Erica Zanre opened the scoring on Sunday afternoon. PIC: Mike Robey Photography. 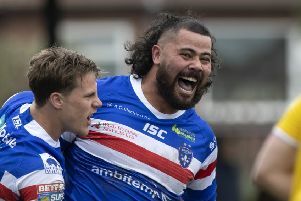 Wakefield won a low-scoring encounter at York City Knights 10-6, scoring twice to take a 10-point lead before York grabbed, what eventually proved, a consolation. Chloe Billington's try clinched victory in York. PIC: Mike Robey Photography. Erica Zanre opened the scoring on Sunday as she planted down underneath the uprights, with Lisa Taylor tagging on the extras. It remained 6-0 until 50 minutes when Chloe Billington crossed to give Trinity some breathing space. That try proved crucial as Daisy Sanderson powered over for a converted try eight minutes from time. “I am happy we got the win but I am not happy with the performance,” admitted Hirst. “Knowing where we have been and what we are capable of playing like, we didn’t perform well at all. “We got dragged down a little bit. “I think we showed some nerves, we knew what the game meant and it was one we were pushing to win. “Some of the players haven’t been in that position before and we made some silly mistakes to put pressure on ourselves. Trinity suffered a 58-4 defeat in their opening game against Leeds Rhinos but only conceded one try at York on Sunday afternoon. Hirst added: “The try they ended up scoring was actually a real soft one. Wakefield will have a weekend’s rest over the Easter period before facing their third consecutive away trip in 2019. Trinity travel to Bradford Bulls on April 28, and Hirst is expecting a testing encounter. The Bulls have played just one game so far this campaign, beating Featherstone Rovers 38-16 on the opening weekend. “We will look to get back on our feet, but it is nice to be looking towards Bradford having got the first win out of the way,” said Hirst. “The win was the most important thing and any win away from home is good. “But playing a team like Bradford, we have got to improve massively from our performance last weekend."